I am a Linfield College graduate. While I was here, I earned my B.A. in Elementary Education. I experienced teaching in a 4th grade and 1st grade classroom, and I loved them both! Now I am a (sorta) newlywed, as of July 2013. My husband and I both attend WOU currently, he in the Computer Science undergrad program and I in the MSEd grad program. 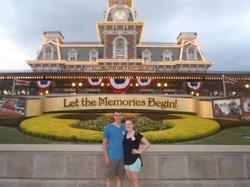 We love traveling are are diehard Disney fans.